After just three years, having grown to a membership of over 80, we will be changing from a Support Group to a Full Branch of Parkinson's Disease Society of Great Britain. 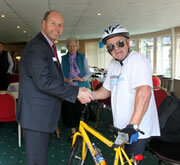 This year Parkinson's UK held their Parkinson's Awareness week from the 16th to 22nd April 2012. 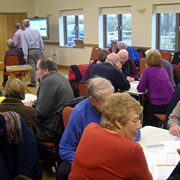 Members of the Wincanton Area Parkinson's Group engaged in various activities to inform the public about the disease and raise funds for future research. Parkinson’s Awareness Week takes place between 16th and 22nd April 2012, a very busy time for Parkinson's UK, in getting the message to the general public about what Parkinson's Disease is and trying to raise funds for research into a cure. The year 2012 has been designated "Find a Cure for Parkinson's Year", by Parkinson's UK. To this end, Richard and Sue Young held a coffee morning at their home in Charlton Horethorne on 7th February to raise money for research. Wincanton and Area Parkinson's Group is hosting an illustrated talk about this unique island at its monthly meeting on November 16th in the Meeting Room of Wincanton Memorial Hall from 2.30pm - 4.30pm. Admission £2 to include refreshments (£1 for members). 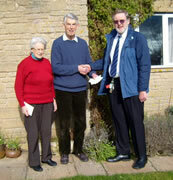 On 19th October 2011 the Wincanton and Area Parkinson's Group held its first birthday celebration at Memorial Hall, Wincanton, where over 60 invited guests, members and family attended. Having recruited thirty members within a year Steve Beech was nominated as one of the recipients of an award, in recognition of the work he has put in at the first ever Parkinson's Volunteer Recognition Day for Parkinson's South West Region. Members of the Wincanton and Area Parkinson's Group spent Thursday 14th in the foyer of Morrisons handing out leaflets, collecting donations and talking to people about Parkinson's Disease.